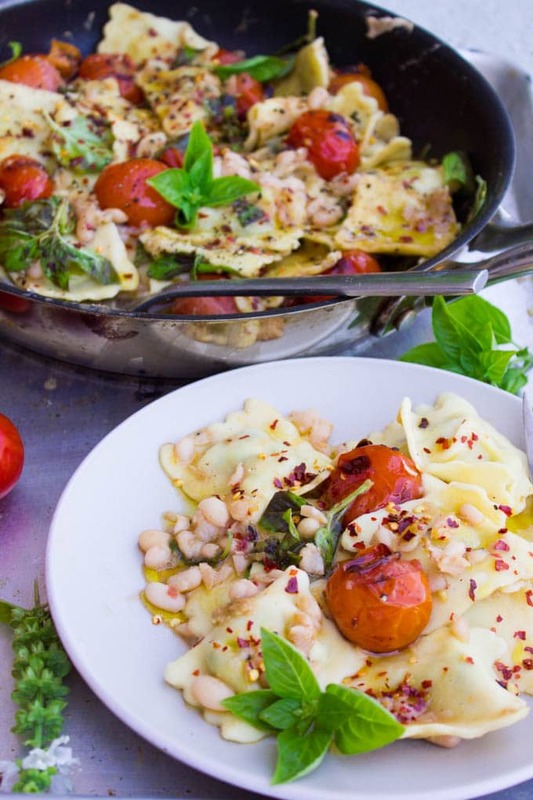 This 15 Minute One-Pan Ravioli recipe with fresh tomatoes, basil and white beans is made for busy weeknights! The addition of chilli flakes and a sprinkle of fresh Parmesan cheese take this easy vegetarian pasta dish to the next level! Pasta. That single word can bring so much comfort. It also happens to be easy and quick to prepare. So I can probably say without a doubt, pasta is my go-to comfort food. Hands down. 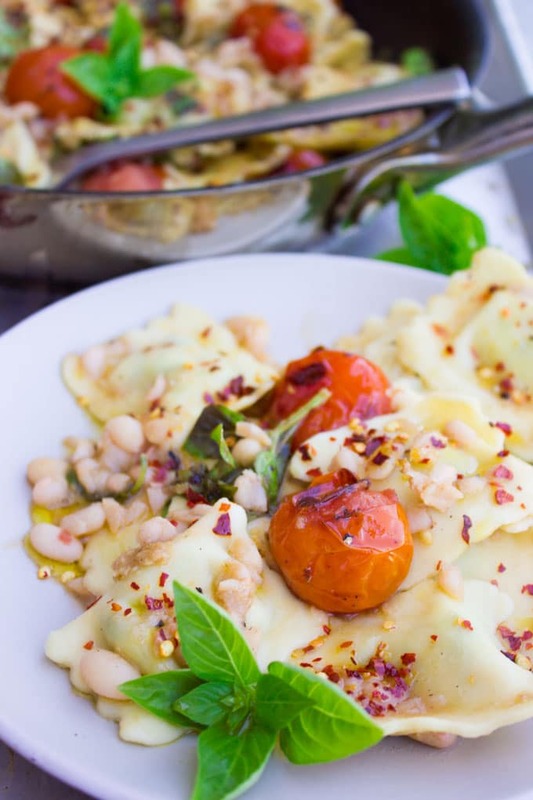 In this post, I share with you one of my favourite pasta recipes: a 15 Minute One-Pan Ravioli Recipe, light and fresh with tomatoes, white beans and basil. 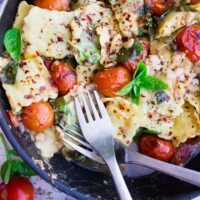 You can certainly add some grated cheese, asparagus, broccoli or your favorite pasta toppings here, but since it’s all about simple comfort food, I’m going with the basic simple one-pan ravioli recipe. This recipe for 15 Minute One-Pan Ravioli ist so quick and uncomplicated! Sometimes at the end of a long workday, I just don’t feel like cooking an elaborate dinner. We’ve all been there. If the idea of just throwing some simple ingredients together in a skillet and wait 15 minutes, to have a big plate of comfort food appeals to you, this recipe for 15 Minute One-Pan Ravioli is for you. This 15 Minute One-Pan Ravioli recipe is all about the base. To make this fragrant base, we sautee a bit of garlic in butter (or olive oil ), then add in the ravioli, baby tomatoes and some fresh basil. Then, we add in some stock, cover the pan for 10 minutes, add in the beans, some basil pesto and cover the one-pan ravioli for another couple of minutes. 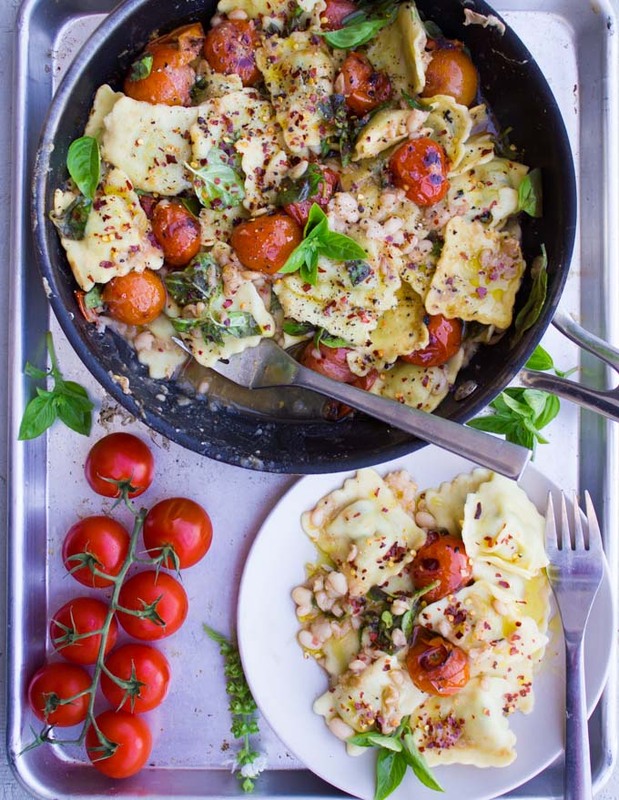 Some other things I love to add to this 15 Minute One-Pan Ravioli recipe, are chilli flakes and a sprinkle of fresh Parmesan cheese. Seriously, the easiest way to take this ravioli recipe to the next level. I will say for the record that a touch of cream wouldn’t hurt your ravioli at all. It would make the taste even better and add a touch of extra comfort and creaminess. White beans and pasta are a perfect pair for me, however, feel free to swap that for some asparagus, broccoli or chickpeas! 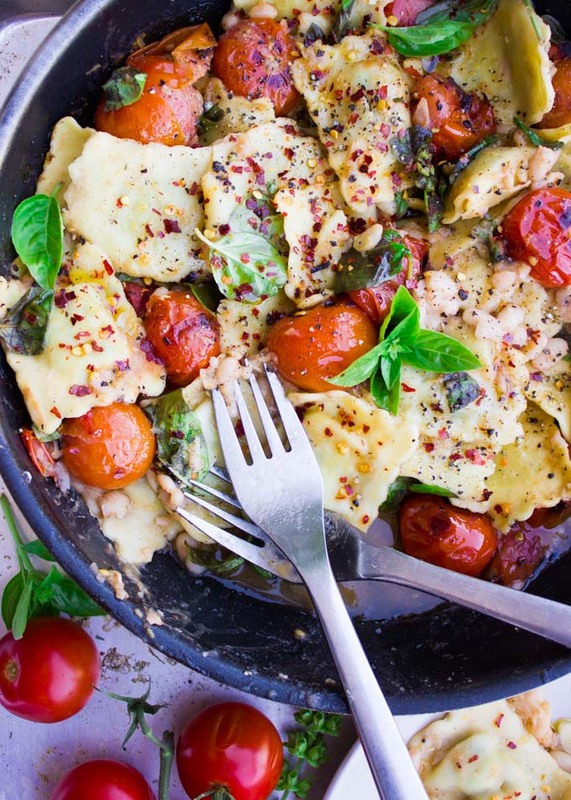 I think anything you add here will certainly make this One-Pan Ravioli dish taste amazing! 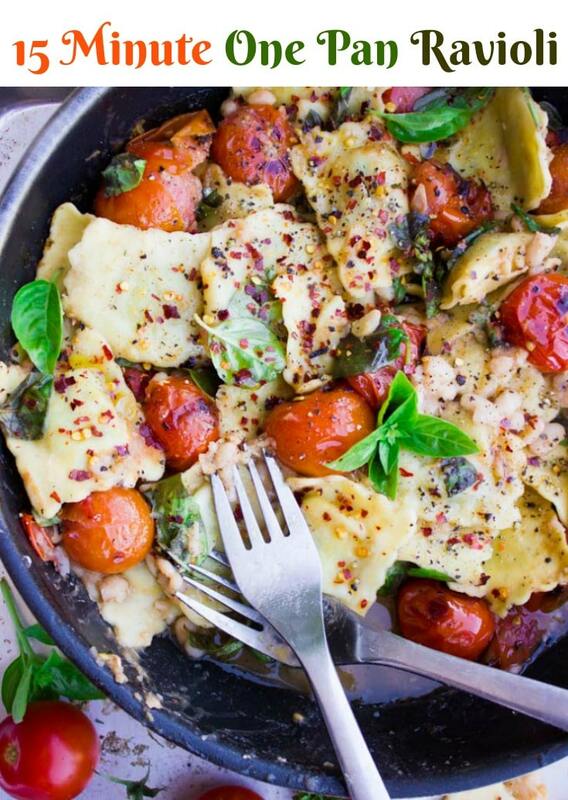 Chilli flakes and a sprinkle of fresh Parmesan cheese take my One-Pot Ravioli to the next level! For more easy pasta recipes, try my 10 Minute Greek Cheese Tortellini or my One Pan Creamy Mushroom Tortellini recipe. Preheat a 9-inch deep skillet with the butter. Add the garlic and sautee for a minute. Then add in the ravioli and tomatoes. Sautee for a minute and add in the fresh basil. Sautee for another two minutes. Add the stock, cover the skillet and cook until the ravioli are tender ( about 8-10 mins). Add the white beans, basil pesto and cook for another 3 minutes. Then finish off with seasoning and parmesan cheese if you like. Serve and enjoy! This looks fantastic and your pictures are really, really good. 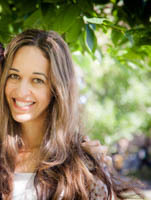 With a few simple substitutions, I can totally make the recipe vegan to go along w/ my diet. Thanks for sharing. Thanks Deborah! absolutely you can! You had me at one-pan! Plus I love ravioli. Such a great recipe for a busy weeknight! hahahah I knew it Liz! I love the flavors and how colorful this dish it. Actually perfect for warmer weather like Florida where I live ! I need to make it soon! Claudia, I envy you and miss the years I lived in Miami so much!! Enjoy it! This is perfection! When I’m not cooking for the blog, I love to have simple dishes like this that come together easy. This is so yummy! I love the beans and chili flakes …and pesto! this looks like an amazing meal. I can’t wait to make this and dig in! This ravioli dish look way too good. I love the fact that you added a pinch of chili flakes. Ravioli dishes are one of my comfort foods. I will definitely be trying this recipe. Thanks Mirlene! Comfort food at its’ best!